So I have been trying to find the source of water intrusion in the forward bilge. 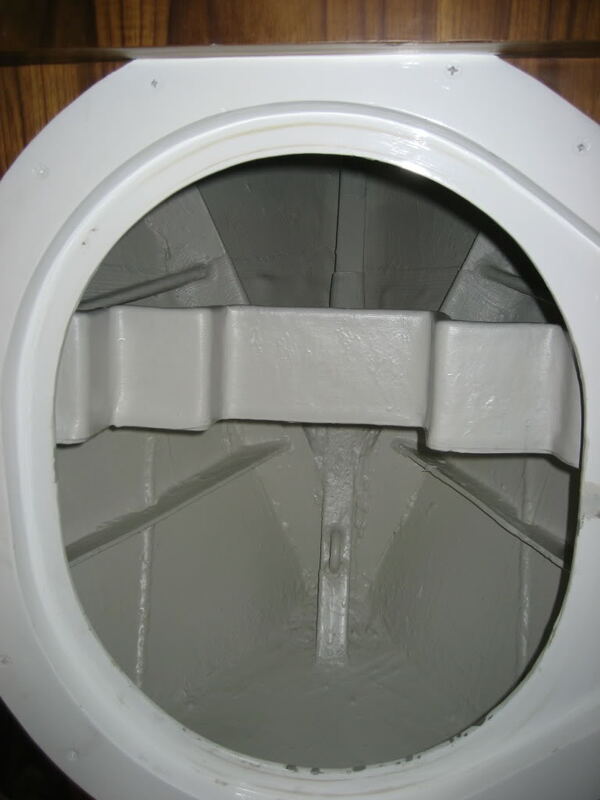 With the admiral at the helm I inspected the anchor rode locker door and found the bottom weeping water into the bilge. I took off the anchor locker door in the forward stateroom and it was full of water. Stopping the boat, it all drained out. At various speeds from idle to 10 knots the water began to come into the compartment, and faster the faster we went. I can see the stain on the locker walls just above the bottom of the locker door. So I think the solution is some sort of backflow preventer. Can any one help me source some sort of in line backflow preventer? Or do you have another suggestion? Clearly relying on the forward bilge pump to run flawlessly is a recipe for disaster so I will greatly appreciate the help. I think a checkvalve of any kind will cause trouble from the mud and debris that comes off the anchor chain. 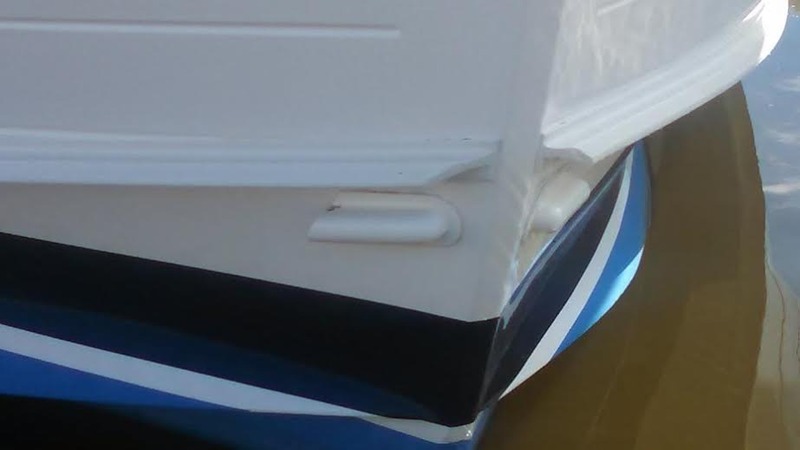 Does the drain go to a thru-hull just above the waterline? A stainless clamshell cover over the opening should keep the water from being forced up the hose. So here is a photo of the drain. Yes, just above water line. Not sure what I could use on this irregular shape. Here is what I am thinking... to be installed inside rode locker. Thoughts? I agree check valves probably will clog but it may be your only solution assuming that you have some hose from the locker to the hull. Is that an aftermarket spray rail added to the bow? Perhaps cutting it back to beyond the drain will prevent the bow wave from overtopping the drain. Another thought is some sort of flapper on the outside of that drain shield. Is the drain of the locker above the spray shield? If so perhaps new higher drains might work. Relocate the drain outlet above the spray rail. What does Grand Banks have to say about this obvious design flaw? Forget the clamshell, you already have 2 essentially. Is there any way you can borrow a Gopro camera, mount it on a boat pole and take some video of how the water is flowing underway? I mean is it flowing up the side or down from the sprayrail? That would show what would work the best. I can't tell from the angle, but is the bottom side undercut to not act as a scoop for falling water? Unfortunately that would leave water in the bottom of the locker. They are blaming it on the spray rail but a friend with the same boat and no spray rail has the same problem. They have not been much help yet. Being the 3rd owner of this boat may not help me. Block the drains. You don't get all that much water in your locker with chain retraction so just let it drain into the bilge and pump it out. That's what I did with my 32 but I rarely got enough water in the bilge to worry about. I think all the older GBs drained to the bilge. watch the bow wave and see if it extends very far aft. It may be possible to extend those drain covers. Unfortunately the water will remain in the locker. The only reason it gets in the bilge is it gets higher than the access door and leaks out. It drains completely when boat is not moving. I think I will try longer extensions on the drains as another suggested. Is there any way to run an internal drain line to your bilge? Then you could block the external drains and the bilge pump would only have to deal with minor amounts of water after using your anchor. If thst doesn't eork then I guess you could route the drain lines to a sump box and plumb it over board. A bit of a PITA but it might be the only answer. Or now that I think about it maybe run the drain lines to your fwd A/C discharge water line a T them into that perhaps. I would not want anchor water and junk in my bilge is I could help it. I would think that if it is a design issue, then all the GB 47 owners would be dealing with it. If so, GB would have been made aware of it at some point and should be able to offer some ideas. Is the bottom of the rode locker at the same level as the exterior drain or is there a hose connecting it? If there is a hose, then I would relocate the exterior opening above that splash rail. I agree with the others that a check valve will be a problem. Installing a raised chain "bucket" to raise the drain inlet might work. Thanks to all for the great ideas and analysis. Where does your forward head shower drain to now? Could you add a drain hose from the anchor compt to it?